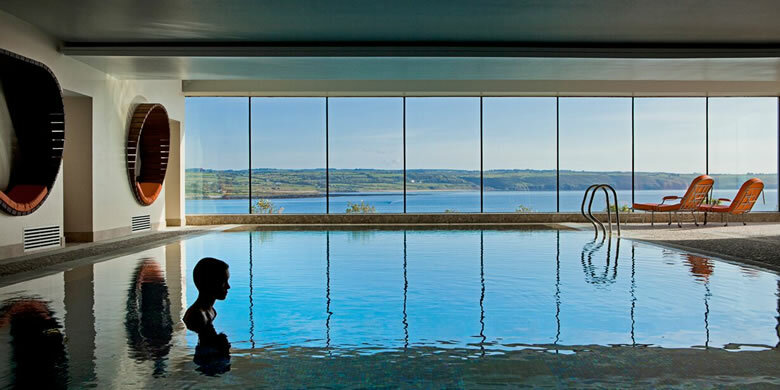 Fall in love with 10 of Ireland’s very special spas. Each with their own amorous views and perfectly equipped with facilities and services to melt a couples’ hearts. Discover surreal sea views, open air pools, couples suites, stunning landscapes, world class spa facilities and luxury decor. Lying on the shores of Killarney’s Loch Lein, the stunning Europe Hotel captures the true beauty and serenity of this incredible corner of Ireland. 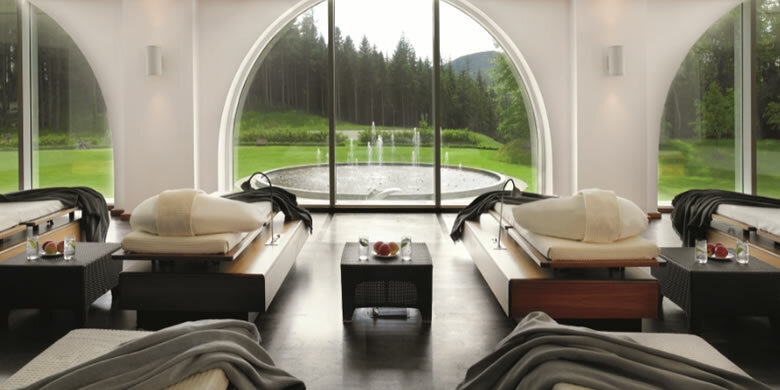 ESPA at The Europe is an oasis of peace, calm and tranquillity; an intimate experience you will always remember. You and your loved one can relax in the cocoon of their heated loungers where the peaceful sound of the water on the lakeshore will lull you into a gentle rest. An topping it off with a Private Spa Suite beautifully designed just for couples. This 5-star Victorian hotel with its 46 individually furnished bedrooms is located in the idyllic heritage town of Kenmare, overlooking Kenmare Bay and the majestic Cork and Kerry mountains. The ultra modern SÁMAS Spa features a 25mt lap pool from where you can admire the peaceful lake surrounds and beautiful forest, perfect for couples who are looking for an escape. The energy engaging facility, constructed of stainless steel, compliments the passive nature of SÁMAS. 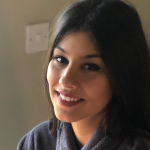 SÁMAS’s unique approach recognises each clients’ distinctive needs. You don’t have to decide what actual treatment you want until you arrive in the spa, complimenting your present energy and mindset. Your adventure begins when you enter through the grand stone gates of the remarkable 800-year-old Ashford Castle Hotel. Completely restored to a 5-star standard, today it is part of National Geographic Unique Lodges of the World, and was once home to the Guinness family. With breathtaking, elevated views over Lough Corrib, The Spa at Ashford Castle comprises of 5 beautiful treatment rooms, including a private couple’s room. All facilities have been expertly designed to induce a sense of serenity from the moment you enter. Here you will find the dreamiest indoor pool and exquisite decor. In keeping with the elegant style of the castle, enjoy an extensive range of indulgent treatments that will leave you feeling restored. Choose from regenerating facials, refreshing scrubs, detoxifying wraps, aroma and marine therapy and more. Only 5 minutes from Kilkenny, the 5-star Lyrath Estate’s picturesque 17th-century house marries a modern-day extension and sits most elegantly amongst 170 acres of mature parkland, complete with picturesque lakes, historic gardens, and emerald woodlands. Alongside its many treatments on offer, the Oasis Spa has 10 treatment rooms, 2 couple’s suites and 1 specially designed-for-purpose herbal bath room. Venture to the open air hydrotherapy pool where you can bathe in the warm healing waters while admiring their gorgeous gardens. Withdraw to the Powerscourt Estate’s impressive surroundings and stunning views of the Wicklow Mountains. Within the 1,000 grounds you’ll discover woodlands, golf courses, a farm, waterfall, 47 acres of landscaped gardens and the 5-star Powerscourt Hotel. Perhaps one of the most notably facts, is that it’s a mere 30 minutes drive from Dublin city. 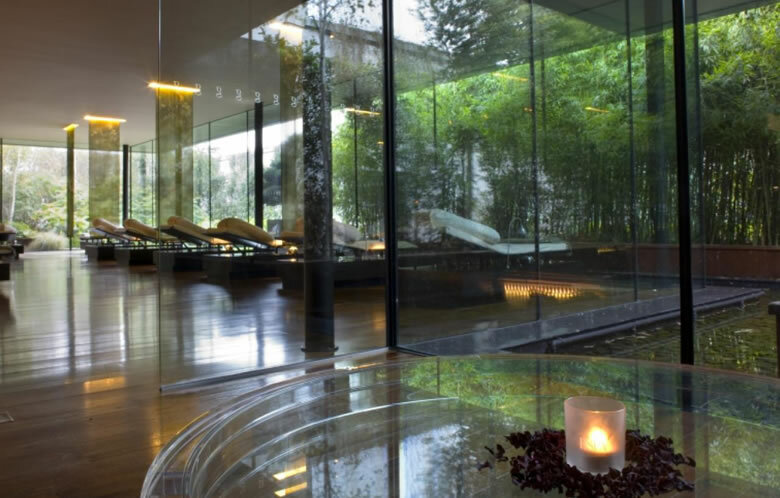 Treatments at ESPA at Powerscourt Hotel Resort & Spa are exclusively by ESPA, and designed to offer a personalised experience with each treatment created to meet the needs of the moment. The spa’s dramatic spaces feature stone, wood and slate fittings. It’s a harmony reflected in the quiet serenity of the Sugar Loaf’s peaking from across the valley, and perfect for a couple’s escape. Enjoy views of the mist snaking its way across the hill tops as you bathe in the Swarovski crystal-lit pool, feeling fancy and romantic at the same time. 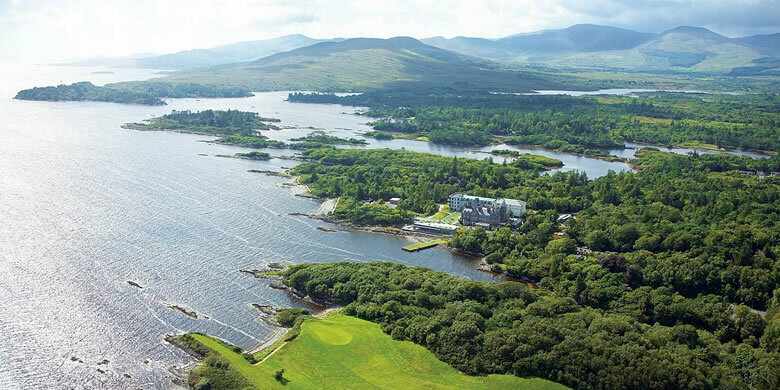 Set on a stunning 500 acre paradise of islands, inlets and hidden beaches, the Parknasilla Resort & Spa will capture your heart with the stunning views overlooking the calm water of Kenmare Bay on the Ring of Kerry. The philosophy at The Spa at Parknasilla Resort is “nature inspired wellness”, clearly expressed as it’s surrounded by the natural beauty of woodlands, ocean and mountains, the perfect picture for a memorable romantic escape. The Spa comprises 12 treatment suites decorated in soothing shades of deep chocolate, cream and caramel, incorporating hand cut stone and honeyed tones of wood, oversized treatment couches and large walk in showers. Bathe in the outdoor hot tub while gazing out on Kenmare Bay and the Kerry Mountains. Beautifully styled bedrooms, stunning sea views, private pampering facilities and effortless service, creates a perfect combination of elements to unwind. The 4-star Ice House Hotel is nestled on the banks of the Moy, with stunning views stretching across the river and out to the Atlantic Ocean. 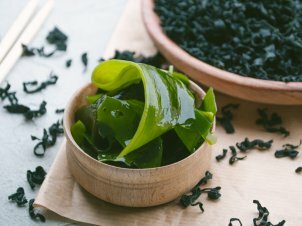 The Chill Spa has 5 luxurious treatment suites, a couples treatment suite and the ultimate selection of VOYA organic spa treatments to leave you completely pampered. 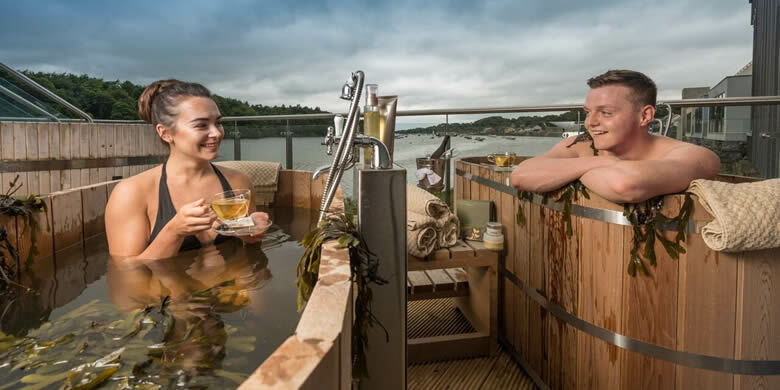 Overlooking the River Moy, the spa garden area has 2 outdoor hot tubs and an outdoor barrel sauna which is unique to Chill Spa, the perfect place to feel cosy with your dearest while you are admiring the spectacular views. The thermal suite is spread across indoors and outdoors. Inside the spa you can discover steam room and experience showers with hot and cold water jets, while outside you have the pièce de résistance! 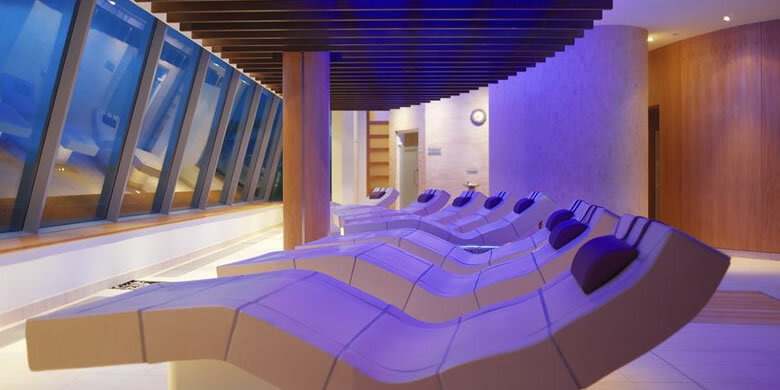 World leaders in spa design and product, ESPA developed the total concept and design of the 5-star ESPA at the g hotel, Galway. Located on the upper two floors of the hotel the ESPA thermal and hydro experiences provide a selection of ‘hands-off ’ therapies to relax and rejuvenate the body and mind. Journey to the Vitality Pool with its soothing and therapeutic views of the water-wall feature, Rock Sauna, Crystal Steam Room, Tepidarium Heated Loungers, Ice Fountain and Lifestyle Shower to rejuvenate your senses. And to finish, arrive at a naturally lit relaxation room overlooking the rooftop Zen bamboo terrace. Perched on the cliffs of beautiful Admore. 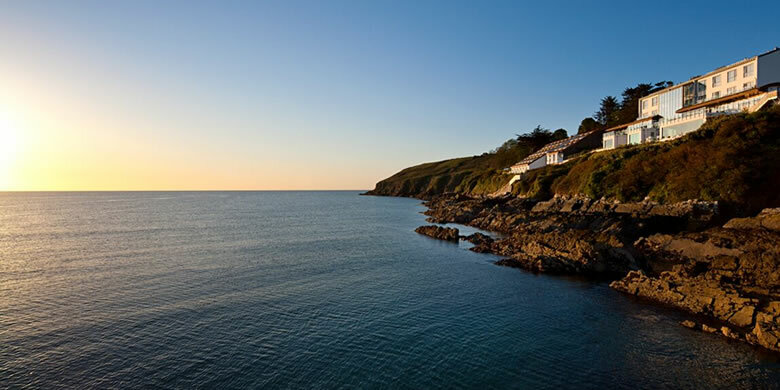 With breathtaking sea views, the stylish 5-star Cliff House Hotel is an ideal retreat for couples. 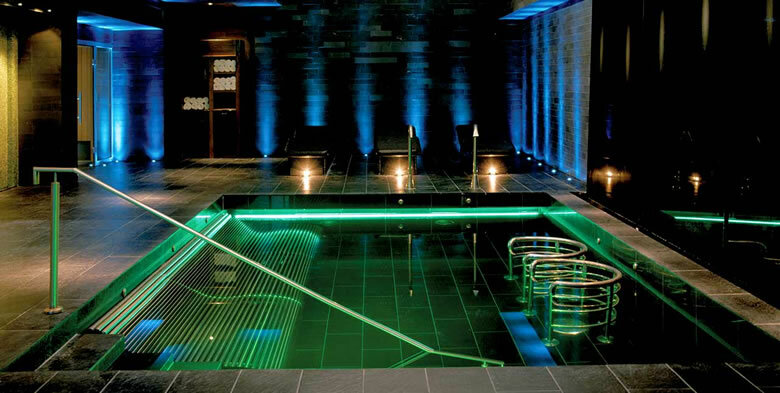 The Well Spa’s 15m indoor infinity-edge swimming pool makes a proud centerpiece. The floor-to-ceiling windows and ocean views create a sense of unending space, as if the pool is merging into the Irish Sea. 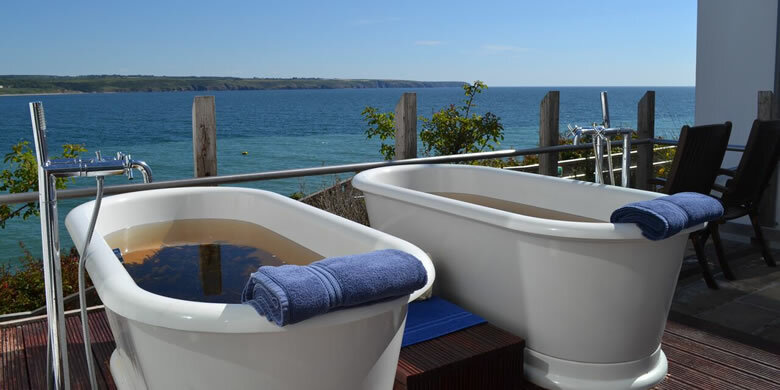 Outside, find a natural rock pool, an outdoor heated Jacuzzi, relaxation terrace with 2 stone baths, allowing you to benefit from the refreshing sea air in comfort. Inside, explore the spa, sauna, steam room and 4 treatment rooms, including a couple’s treatment room. 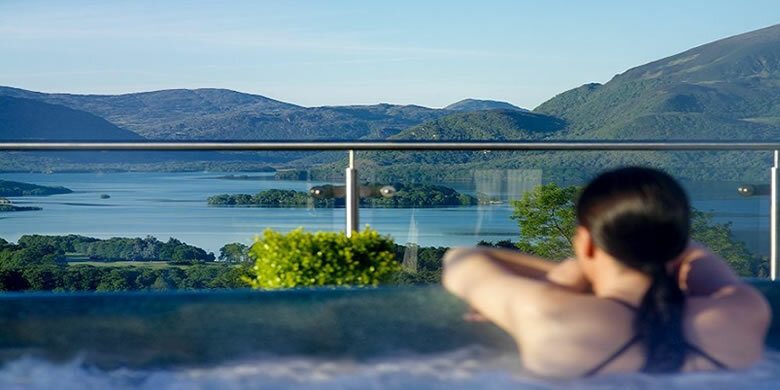 Our fourth retreat from The Kingdom County, the luxury 5-star Aghadoe Heights sits majestically on a hilltop, gazing over majestic Lough Leane. 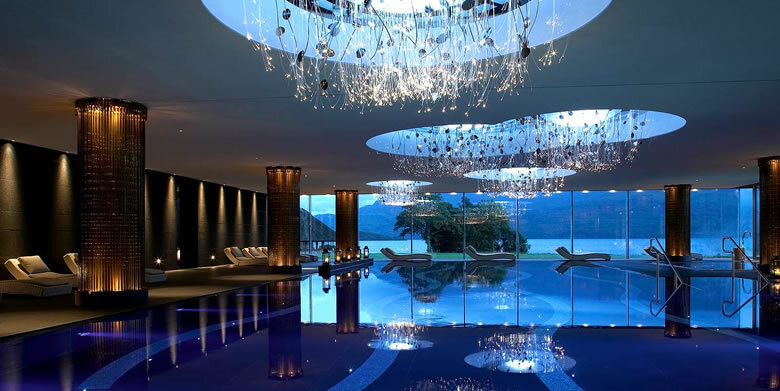 The award winning Spa at Aghadoe Heights draws inspiration from the breath-taking beauty and spirit of the surrounding area. The 10,000 sq ft purpose-built retreat fuses natural slate, cascading water and a palette of colours inspired by wild Irish flowers and grasses. The Spa at Aghadoe has created a refuge from everyday life, a space to rediscover yourself in a hideaway of peace, calm and award winning comforts. Within the 10 luxurious treatment rooms and a dedicated couples treatment room, Aghadoe’s expert therapists offer a host of treatments including both his and her’s treatments and couples packages. Journey through one of Ireland’s finest thermal suite experiences featuring Laconium, Hammam, Rock sauna, Aroma grotto, Tropical rain shower, Aghadoe hill mist shower, Deluge shower. Melt away to a different world on the the heated loungers in the tranquil Relaxation Area or watch the sun set over the lakes and mountains in the outdoor hot tub.